Happier days, when Dinh The Huynh was seen as rising force in Vietnamese politics. In a country where any attempt at meaningful political reporting can land you in jail, Vietnamese citizens are reduced to educated guesswork if they want to know what their representatives are up to. So when a key figure in the leadership is replaced by another, and the official press offers only the blandest of explanations, they tend to suspect dark dealings in the murky waters of the Communist party hierarchy. Illnesses, public appearances (or the lack of them), and placements at official functions are sometimes the only clues as to who is on the rise and who’s lost out in the internal wranglings of the Communist elite. 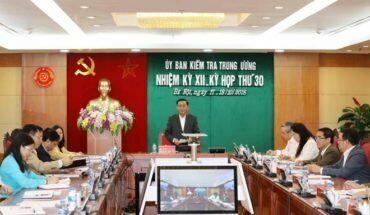 When Dinh The Huynh, once seen as a strong contender to be next general-secretary of the party, came down with an unspecified illness last year and was temporarily replaced, most observers assumed that his career was over. The leadership has confirmed that the man who stepped into his shoes, Tran Quoc Vuong, is now his permanent replacement. 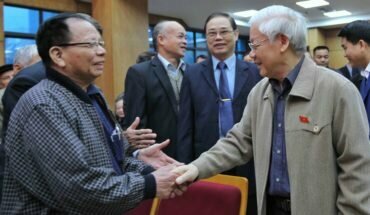 Mr Vuong, seen as the right-hand man of the current party boss, Nguyen Phu Trong, and the driving force behind his sweeping anti-corruption campaign, has emerged as one of the most feared figures in the party leadership. His appointment to the nebulous sounding position of “executive secretary of the party’s secretariat” seems to suggest that the tight grip already held by Mr Trong and his allies is now even tighter. Given the lack of explanation by any of the protagonists themselves, and no specifics on the nature of Mr Huynh’s much reported “illness”, it’s inevitable that theories will bounce around social media about what’s really going on. 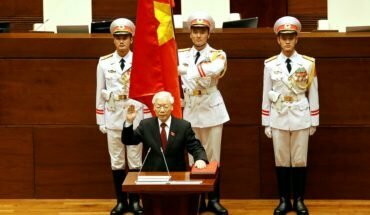 Some speculate that the timing of the announcement was designed to coincide with the arrival of the US aircraft carrier, Carl Vinson, at Danang – perhaps an attempt to reassure China that hardline communist apparatchiks were still in charge in Hanoi and not about to sell out to the Americans. It has been pointed out that Mr Huynh’s last big appearance on the political stage was when he went to Washington in October 2016 and discussed measures to contain Chinese expansionism with the then secretary of state, John Kerry. That led to speculation that the former state media executive and propaganda chief was being groomed for the leadership of the party. Not long afterwards, it was announced that he was being relieved from official duties because of his illness. Mr Trong has made light work of his political opponents and potential rivals since he was reappointed to the post of general-secretary in 2016. The confirmation of a senior position for one of his closest allies does nothing to change the perception that his primary motivation is the consolidation of power – not that anyone working for Vietnam’s state controlled media is in position to explore, question or analyse such a proposition.